The series’ other main character, investigative journalist Mikael Blomkvist, must battle the police and some particularly nasty and corrupt politicians to prove Salander’s innocence. Like the two previous novels, the story starts out leisurely, with more than 100 pages of set-up, before an unexpected shooting kick starts the real action. I won’t give away any spoilers but fans won’t be disappointed. Larsson has constructed another complex, compelling and taut page turner. “The Girl Who Kicked the Hornet’s Nest” is equal parts detective story, courtroom drama, spy procedural, cyber-thriller and Swedish civics lesson. The book exposes the inner workings of Sweden’s secret police. It also borrows from a painful chapter in Swedish history, the assassination of Prime Minister Olaf Palme. Even though the book was written six years ago, it seems eerily relevant with its spot on look at the decline of newspapers in yet another sub-plot. At the heart of “The Girl Who Kicked the Hornet’s Nest” is the tense relationship between Salander and Blomkvist. They’re the most interesting characters and the driving force of the trilogy. Will the pair survive their ordeal, will they end up together, or even end on speaking terms? While the story finishes on a satisfying note, it’s evident how the characters could have continued on. 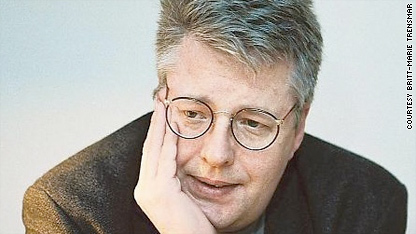 It’s said that Larsson planned 10 books in the series, but he died unexpectedly in 2004 of a heart attack, before his novels were even published. Larsson never knew his worldwide success. There are rumors of an unfinished fourth book that could be forthcoming, but for me this was a fitting end to the series. Sadly, it’s the readers’ loss that Larsson didn’t live to see Millennium continue on. A quick note on “Nordic noir” the nickname given to Scandinavian detective fiction and a current global publishing phenomenon. Larsson’s “Millennium” trilogy may be the most popular among current titles in translation, selling as many as 27 million copies worldwide, but there are a number of authors from faraway locations like Stockholm, Oslo and Reyjavik gaining an avid following among English speaking readers around the world. Henning Mankell, also from Sweden, runs a close second to Larsson. The 9 books in his Kurt Wallander series have sold millions of copies, spawned several films and a TV miniseries starring Kenneth Branagh. Other popular authors include Jo Nesbo, K.O. Dahl and Karin Fossum from Norway, Ake Edwardson and Hakan Neser from Sweden and Arnaldur Indridason of Iceland. Many critics point to Per Wahloo and Maj Sjowall as pioneers of the genre. The Swedish husband and wife team penned the popular Martin Beck series from 1965 to 1975. Fans describe Nordic noir as existential in nature, a bit like if Ingmar Bergman rewrote “The Big Sleep.” The stories are less about action, and more thoughtful police procedurals, think of them as dogged detective stories set in a colder climate. The prose is sparse, simple and stripped down. The themes are dark, even bleak at times. The characters are often gloomy, morose, and troubled. Most Nordic noir heroes are battling some sort of demons, be it alcoholism, depression, or diabetes, making them more human and empathetic to readers. In my opinion, the settings are really the key to Nordic noir’s success. A long dark night, a city blanketed in white snow, a street stained with the red blood of a murder victim and a killer on the loose. With summer on the way, what better escape for mystery fan? If you are serious about boycotting California, don't watch American Idol tonight. It's in LA. Pass it on. Best aviator frames and best micro fiber cleaning cloth that you can find online. Millennium trilogy is a creative master piece in my opinion. J'ai demand? ? la jeune fille de American Eagle si leurs v?tements ?taient Jr ou Misses / dames sable, elle m'a regard? comme si j'avais deux t?tes et dit que c'?tait la m?me chose. J'ai des choses ? partir de l? pour moi ma taille habituelle o? j'ai un hoodie Hollister que je devais taille pour que je pense AE est de justesse taille. Les Ts sont super long sur mon DD. Hollister est Jr? Mon DD a Hollister Ts qui correspondent ? son grand dans une taille M, mais ils sont de consignmnet et la substance utilis?e est parfois diff?rente. Elle a un couple Ts de Aeorpostale (M), mais ils sont longs et juste ne regarde pas droit, ils sont coupe-bas si elle porte un r?servoir sous eux.